What Spices Are in Chinese Five Spice? Spices are a customary feature of Nigerian cuisine. 2 What Spices Are in Chinese Five Spice? Nigerian herbs and spices are not unique to the African continent, but the variations and uses of the herbs and spices are different from the typical cuisine served in many other areas. Since its climate usually features distinct wet and dry periods, Nigeria can grow spices such as cloves, Suya spice, curry spices and bitter leaf. 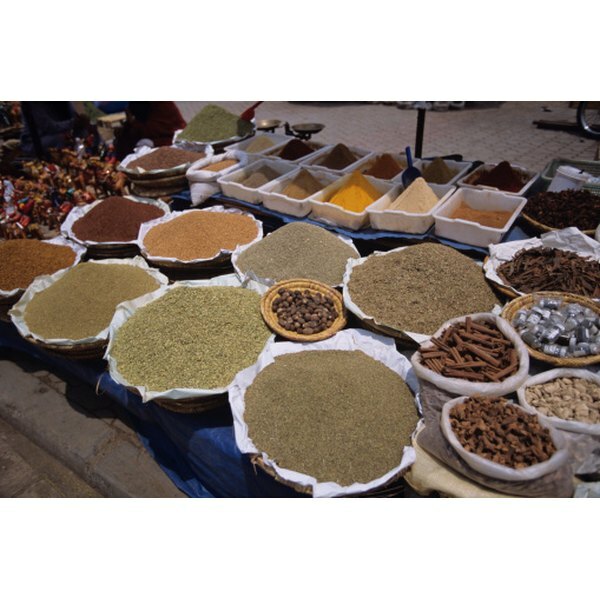 These herbs and spices add to traditional Nigerian dishes and are used throughout the West and North African region. Cloves are very common in African dishes and in Nigeria in particular, and they are traditionally grown in communal family plots or in small-scale gardens. However, clove farms export to most of Africa and around the world. The spice comes from a tree in the evergreen family that can grow up to more than 65 feet. The cloves are harvested from the flowers before the flower opens. Examples of some traditional Nigerian dishes that contain cloves are Nigerian okra soup, pumpkin pork stew, spiced boiled yams and traditional pepper soup. Suya spice, a special Nigerian spice mixture, is a combination of peanuts and ginger. Though peanuts and ginger are the dominant flavors, the diner can detect other flavors such as onion, garlic, cayenne pepper and salt. Suya spice is commonly used on skewers of beef and chicken, which gives the meat a spicy, earthy flavor. Beef suya is cooked with a beef that has no fat, and it is usually cut into 1/4-inch bite-size pieces. Chicken suya is made with skinless chicken meat similar to jerky, and both meats are marinated in the spices for at least two hours to receive the full effect of the spices. Curry came to Nigeria during the time of British colonialism and was embraced by West Africa and particularly the Nigerian people. Curry powders are derived from the Murraya koenigii tree; these powders are usually associated with cumin and coriander. Fenugreek is another well-known curry spice that is derived from a legume, and its pods contain around 10 to 20 brown seeds; the flavor is akin to caramel but more bitter. Fenugreek is often used with green chilies to obtain the spice of the chili and the bitterness of the spice. In both Ethiopia and Nigeria, fenugreek is mixed with gruel as a staple in baby food. Bitter leaf is a Nigerian herb that grows in the tropics that is related to lettuce, daises and chicory. You can reduce or even eliminate the bitter taste of the herb by crushing it and washing the leaves well. It is usually sold in markets fresh, but for export it is dried. It is usually used in stew and soups and gives the dish a bitter aftertaste akin to the tannins in wine. Many Nigerians use the herb as a medicinal component to their diet, and it is believed to reduce the swelling in women’s breasts. 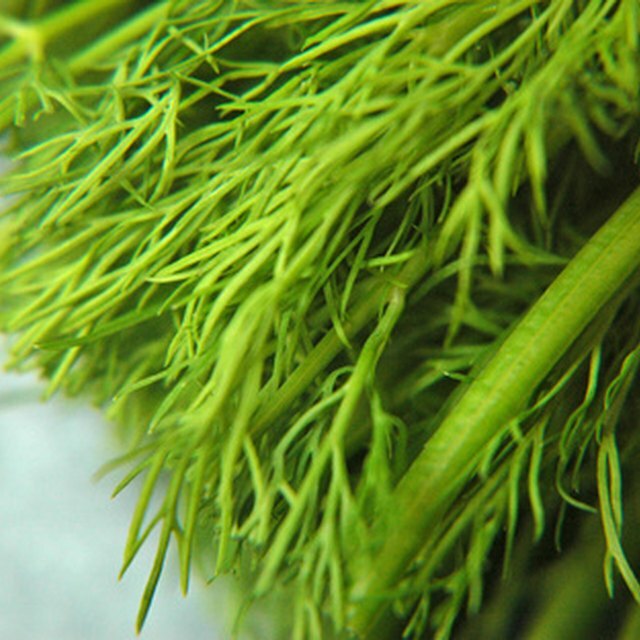 However, it is more commonly used as a remedy for stomach pain, rheumatism and dysentery. Don Rainwater has been a professional writer since 2005. Rainwater has published books including "The Jack Russell Terrier: Canine Companion or Demon Dog" and "How To Manage A Behavior Classroom." He holds a Bachelor of Arts degree from the University of Northern Colorado, a Master of Arts degree in special education and a Doctor of Education degree from the University of Phoenix. What Herbs & Spices Flavor Fish?